Now famous nachos started with just a few humble ingredients in Mexico: tortillas and cheese. 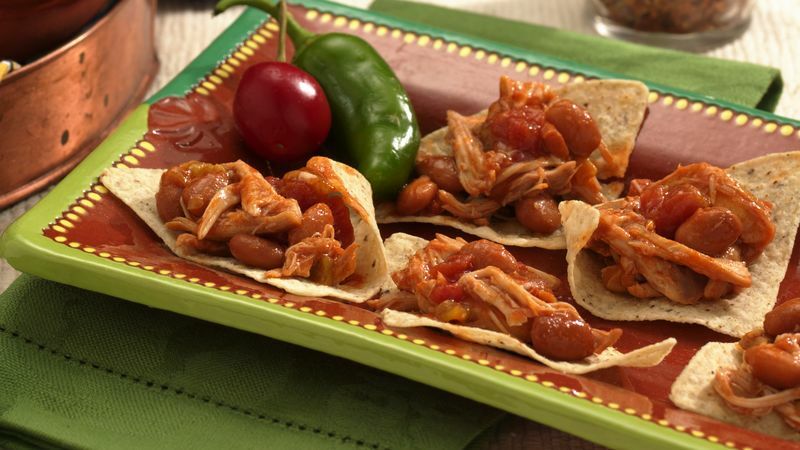 Nowadays, there seem to be endless variations of nachos: loaded nachos, beef nachos and shredded chicken nachos. Toppings are no longer limited to just cheese (though the cheese is so important—never leave out the cheese!). You can find ingredients like beans, tomatoes and sliced jalapeños stacked high on a big plate of nachos, much like this recipe! Though proteins like beef and chicken weren’t always a part of the original nacho recipes, they add some heartiness to the dish if you’re having a nacho dinner night or serving them to a big crowd at a party. This recipe makes it even easier to add flavorful chicken to these nachos by letting your slow-cooker do the work for you; let chicken cook in the slow cooker all day, and then assemble your nacho platter later. Now that you’re a nacho expert, try your hand at enchiladas next!